This is an In Store offer only, and your payment must be made using a registered payment card. Please ensure you wait 24 hours after registering your card prior to making your first purchase. 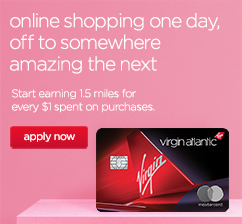 Offer is only available on MasterCard and American Express cards registered to your Virgin Atlantic Shops Away membership. No miles will be awarded for this offer when using a registered Visa card.